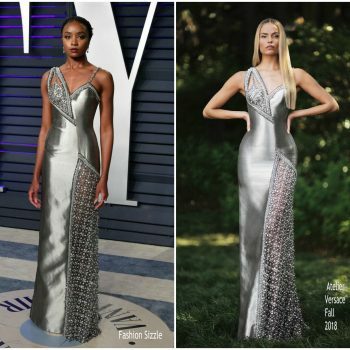 Rosie Huntington-Whiteley wore a silver Atelier Versace asymmetrical gown to the 2019 Vanity Fair Oscar Party. 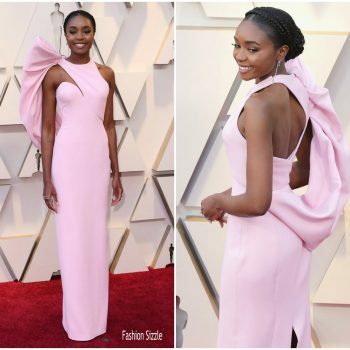 Ciara was in attendance at the 2019 Vanity Fair Oscar Party at the Wallis Annenberg Center for the Performing Arts on Sunday (February 24) in Beverly Hills, Calif. She wore an Atelier Versace gown. Dua Lipa accepted her awards for best new artist during the 2019 Grammy Awards She wore a custom white and black Atelier Versace safety pin embellished dress. .
Gigi Hadid walks the runway at the 2018 Victoria’s Secret Fashion Show After Party on Thursday (November 8) at Avenue NYC in New York City. 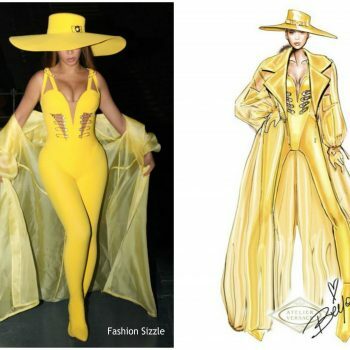 She wore a Atelier Versace jumpsuit. Princess Charlene of Monaco attended the 70th Monaco Red Cross Ball Gala on Friday (July 27) in Monte-Carlo, Monaco. 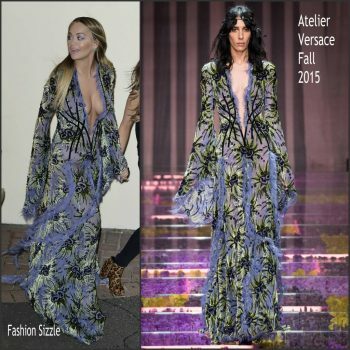 She wore a Atelier Versace gown. Kim Kardashian attended the 2018 MTV Movie And TV Awards on Saturday (June 16) in Santa Monica, California. 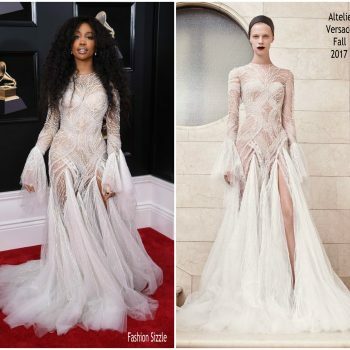 She wore a white Atelier Versace design. Natasha Poly was in in attendance at the premiere of ‘Blackkklansman’ during Cannes Film Festival this evening (May 14). 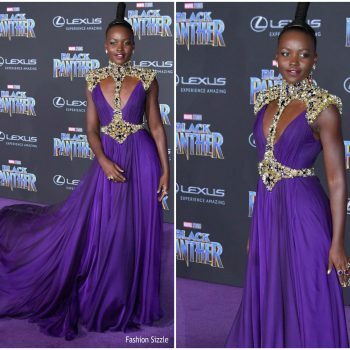 She wore a purple Atelier Versace embellished gown. Bruna Marquezine attended the 2018 amfAR Gala Sao Paulo by her Brazilian soccer boyfriend Neymar. 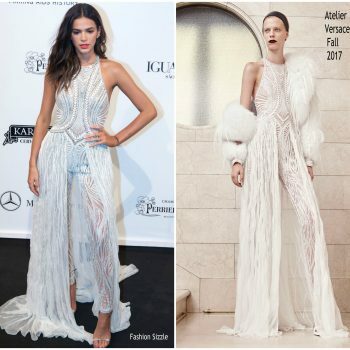 She is wearing a white Atelier Versace Fall 2017 jumpsuit. Paris Jackson was in attendance at the 2018 Vanity Fair Oscar Party. She wore a bright green Atelier Versace crystal-embellished chiffon net gown. Mary J Blige attends the 90th Annual Academy Awards at Hollywood &amp; Highland Center on March 4, 2018 in Hollywood, California. 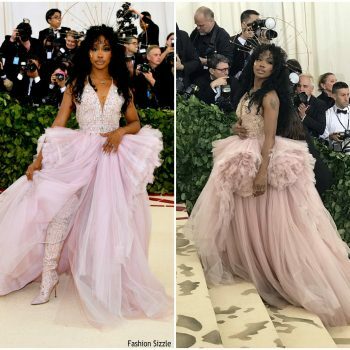 She is wearing a hite Atelier Versace embellished gown. Penelope Cruz was in attendance at the 2018 Goya Awards on Saturday (February 3) in Madrid, Spain. 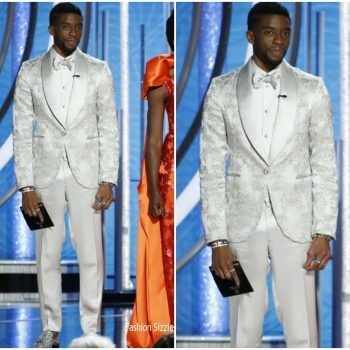 She wore a white Atelier Versace gown styled with Atelier Swarovski Fine Jewels. 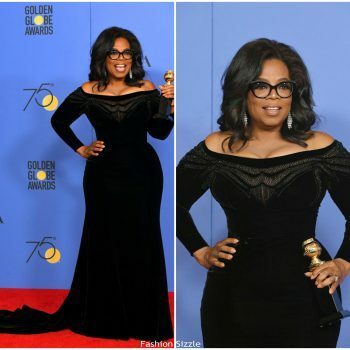 Oprah Winfrey was awarded the Cecil B. DeMille Award at the 2018 Golden Globe Awards on Sunday (January 7), . 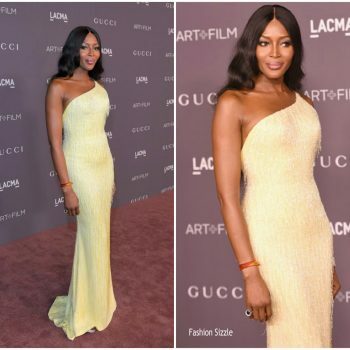 She gave a very powerful and inspirational speech , has many buzzing about an U.S.
Naomi Campbell was in attendance at the 2017 LACMA Art + Film Gala on Saturday (November 4) in LA She wore a canary-yellow Atelier Versace one-shoulder gown . Penelope Cruz attended the ‘Loving Pablo’ photocall held during 65th San Sebastian Film Festival on Saturday (September 30) in Spain. 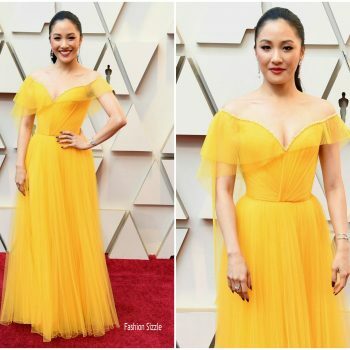 She wore an Atelier Versace gown . 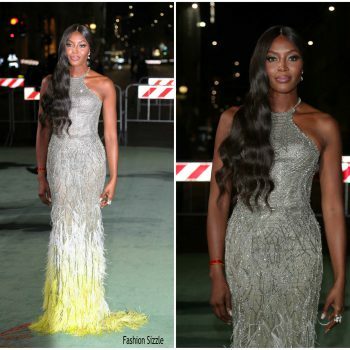 Naomi Campbell was in attendance Green Carpet Fashion Awards She wore an Atelier Versace Spring 2017 Couture gown. Jennifer Lawrence attends the 'Mother!' UK premiere at Odeon Leicester Square on September 6, 2017 in London, England. 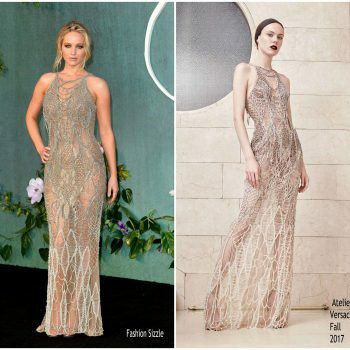 She wore an Atelier Versace Fall 2017 gown. Hailee Steinfeld attended the 2017 MTV Video Music Awards on Sunday (August 27) in Inglewood, California. 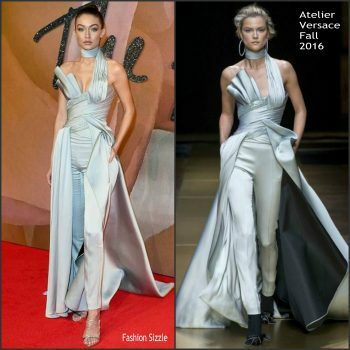 She wore a grey-blue Atelier Versace Spring 2017 grey- mini-dress Her look was completed with silver Versace heels. Cara Delevingne attended the ‘Valerian And The City Of A Thousand Planets’ Premiere on Wednesday (August 2). 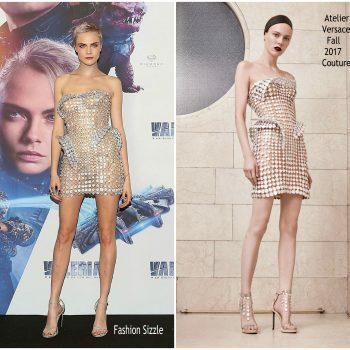 After the Photocall she changed into this strapless Atelier Versace Fall 2017 dress styled with Versace heels. 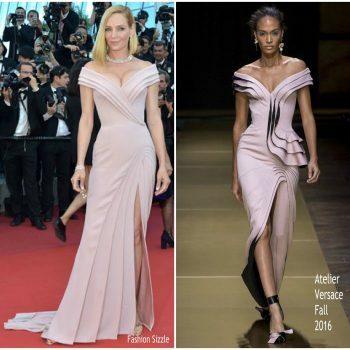 Uma Thurman wore a white Atelier Versace gown to the Fashion For Relief Fashion Show during Cannes 2017. 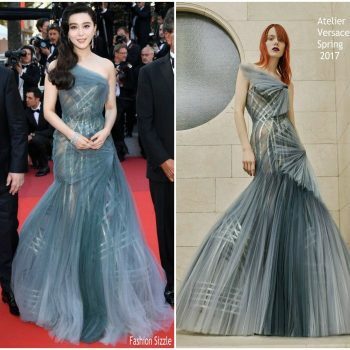 Fan Bingbing was in attendance at the closing ceremony of the 2017 Cannes Film Festival this evening (May 28). 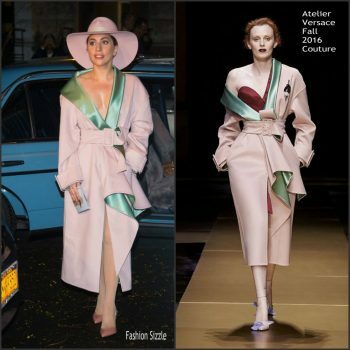 She wore Atelier Versace Spring 2017 gown. Uma Thurman attended the closing ceremony of Cannes Film Festival this evening (May 28). 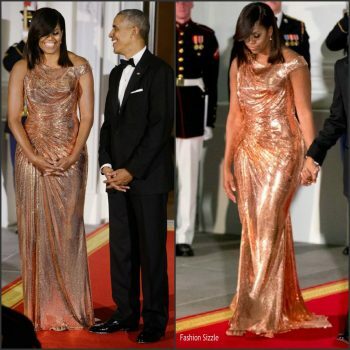 She wore a gold Atelier Versace fringe gown. Irina Shayk attended the Cannes Film Festival 70th anniversary celebration on Tuesday (May 23) at the ‘Hikari (Radiance)’ premiere She wore lemon custom Atelier Versace gown styled with Lorraine Schwartz canary yellow diamonds. Naomi Campbell attended the 70th anniversary celebration of Cannes Film Festival this evening (May 23). She wore an Atelier Versace Spring' 2017 gown. Uma Thurman was in attendance at the 2017 Cannes Film Festival opening ceremony and premiere of ‘Ismael’s Ghosts (Les Fantomes d’Ismael)’ on Wednesday (May 17). 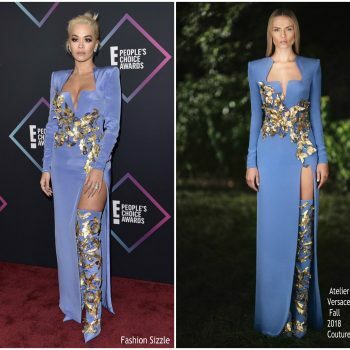 She wore an Atelier Versace Fall 2016 gown. Heidi Klum was in attendance at the Nickelodeon’s 2017 Kids’ Choice Awards on Saturday (March 11) in LA. 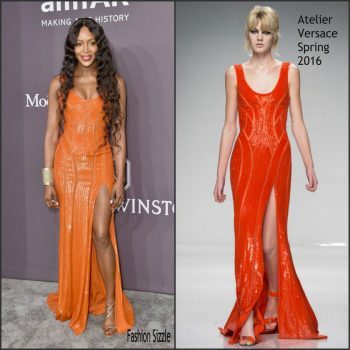 She wore a orange Atelier Versace Spring 2016 gown that has cutouts and thigh-high slits. Jane Fonda attended the 2017 Costume Designers Guild Awards on Tuesday (February 21) at the Beverly Hilton Hotel in Beverly Hills, Calif. She wore an Atelier Versace Fall 2016 gown. Penelope Cruz attended t the 2017 Goya Cinema Awards on Saturday (February 4) in Madrid, Spain. She wore a black custom Atelier Versace gown with Swarovski crystals. 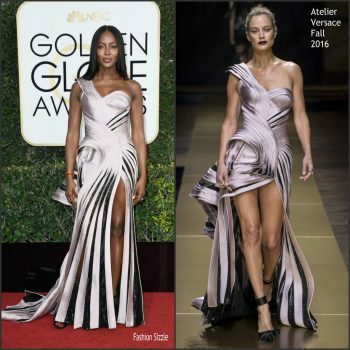 Naomi Campbell was in attendance at the 2017 Golden Globes on January 8, 2017, at The Beverly Hilton in Beverly Hills, California. 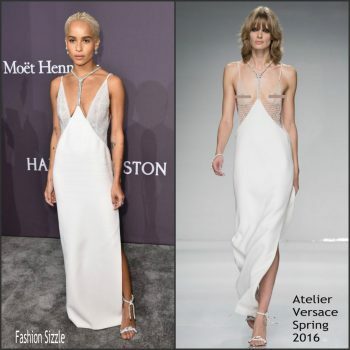 She wore an one shoulder Atelier Versace Fall 2016 gown . Reese Witherspoon attended the 2017 Golden Globe Awards held at the Beverly Hilton Hotel on Sunday (January 8) in Beverly Hills, Calif. She wore a custom yellow strapless Atelier Versace gown. Blake Lively was in attendance at the 2017 Golden Globes on January 8, 2017, at The Beverly Hilton in Beverly Hills, California. 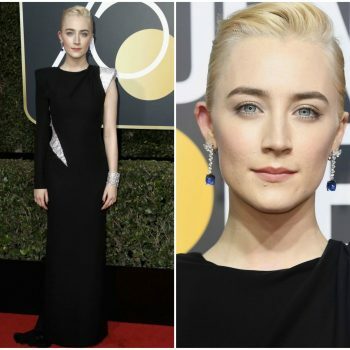 She wore a black AtelierVersace velvet gown . Hailee Steinfeld attended the W Magazine’s Best Performances Portfolio Golden Globes Party on Thursday night at the Chateau Marmont in Hollywood. 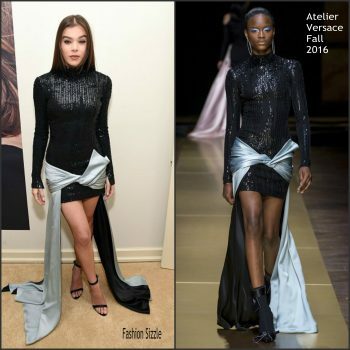 She wore an Atelier Versace Fall 2016 dress . Blake Lively was in attendance at the Hollywood Walk of Fame ceremony today for her husband Ryan Reynolds. 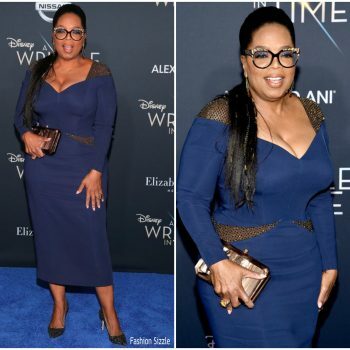 She wore a blue Atelier Versace corset dress . Amy Adams attended the 22nd Critics’ Choice Awards on Sunday, December 11, 2016, in Los Angeles, CA held at the Barker Hanger in Santa Monica, Calif. She wore ac white off-the-shoulder Atelier Versace gown. Actress Nicole Kidman attends the Second Annual "InStyle Awards" presented by InStyle at Getty Center on October 24, 2016 in Los Angeles, California. 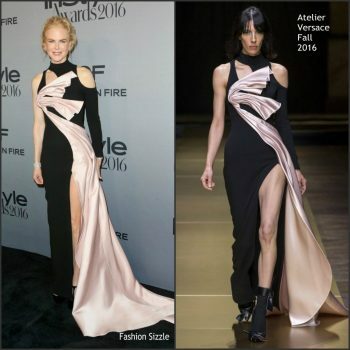 She wore a black and pink Atelier Versace Fall 2016 asymmetric layered gown. Rachel McAdams attended the premiere of her new film Doctor Strange on Thursday night (October 20) in Los Angeles. 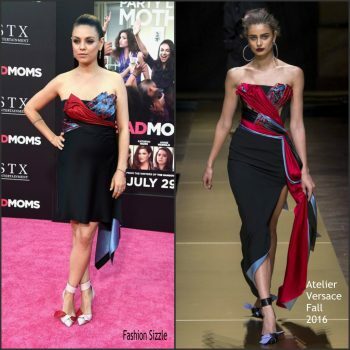 She wore a custom strapless Atelier Versace Fall 2016 gown that has a thigh slit. Mila Kunis was in attendance at the Bad Moms on Monday night July 18 , 2016 at Metrograph in New York City. She wore an Atelier Versace Fall 2016 draped dress and bow heels. Priyanka Chopra attended the 2016 Billboard Music Awards held at the T-Mobile Arena on May 22, 2016 in Las Vegas, Nevada. Ariana Grande attended the 2016 Billboard Music Awards at the T-Mobile Arena on May 22, 2016 in Las Vegas, Nevada. Blake Lively attended the premiere of The BFG during the 2016 Cannes Film Festival on Saturday night (May 14) in Cannes, France. Araya A. Hargate attended the premiere of “Money Monster” at the Cannes Film Festival on Thursday, May 12, 2016, in Cannes, France. Blake Lively attended the ‘Cafe Society’ premiere and the Opening Night Gala during the 69th annual Cannes Film Festival at the Palais des Festivals on May 11, 2016 in Cannes, France.